In this example, we will consider the two-dimensional structure shown below, which is based on a system considered in Chapter 7 of Photonic Crystals: Molding the Flow of Light (second edition). In particular, there are three basic ideas behind this structure, which we briefly summarize. First, by taking a dielectric wavgeuide and perforating it with a periodic sequence of holes, we form a kind of photonic crystal: there are still index-guided modes propagating losslessly down the periodic waveguide, but there is also a partial photonic band gap: a range of frequencies in which no guided modes exist. 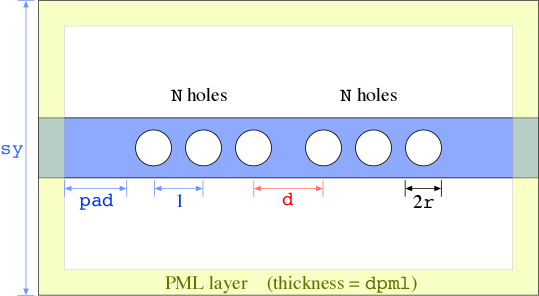 Second, by making a defect in the periodic sequence, in this case by separating one pair of holes by a greater amount, we can trap a resonant cavity mode: it is localized along the waveguide direction by the band gap, and partially in the transverse direction by index guiding. Because there is no complete gap, however, the mode has some intrinsic radiative losses: even with infinitely many holes/periods, it leaks away slowly into the surrounding air. Third, by combining several structures in sequence — ordinary waveguide with no holes, periodic structure, defect, periodic structure, waveguide — we can make a filter. See Chapter 10 of Photonic Crystals: Molding the Flow of Light (second edition). In particular, because there is now a finite number of holes, the resonant mode can now leak into the waveguide as well as to the surrounding air. Then, input light from the waveguide at the resonance frequency undergoes resonant coupling, and is transmitted to the other side with a Lorentzian transmission spectrum. In the limit where the resonant mode couples much more strongly with the waveguide than the air (i.e. if there are not too many holes and the radiative leakage is slow), then in a symmetric structure we should get 100% transmission on resonance, forming a narrow-band filter. In the following, we will analyze the structure in exactly the opposite order of what we really should do. Really, we should analyze the periodic system first to understand the band gap, then analyze the resonant mode, and finally analyze the transmission spectrum. Since all of those calculations have already been done (see the Reference Section of Photonic Crystals: Molding the Flow of Light (second edition)), however, we can jump straight to the transmission spectrum (which is conceptually the easiest computation to understand) and work backwards. See also holey-wvg-cavity.ctl and holey-wvg-bands.ctl which contain the commands below. To calculate the transmission spectrum, much as in the bend example in Tutorial/Basics, we'll measure the flux spectrum at one end of the waveguide from a source at the other end, normalized by the flux from a case with no holes in the waveguide. First, we'll define some parameters of our structure as in the figure above. Note that we'll choose units so that the periodicity is 1 which is a typical choice for photonic crystals. The geometry will consist of a single block for the waveguide and 2N cylindrical holes. To make the holes, we could use some kind of loop (see also How to Write a Loop in Scheme), but in this case it is even easier to use the predefined function geometric-object-duplicates, which replicates a given object by shifting by a given vector a given number of times. See the User Interface. Note that we call geometric-object-duplicates twice, for the holes before and after the defect, and that we combine the resulting lists with the standard Scheme append function. As usual, later objects in geometry take precedence over earlier objects, so the cylinder objects will punch holes through the block. Now, we'll define a couple of parameters to determine the frequency range to investigate. We already know from our calculation below that this structure has a -polarized band gap for frequencies in the range 0.2 to 0.3, so we'll want to cover this interval. Note that we specify the plane by its normal, the direction. See also Exploiting Symmetry. Now, we can run the simulation, using run-sources+ to run until the sources have finished, plus some additional time to allow the fields to propagate through the structure. As in Tutorial/Basics, we'll use stop-when-fields-decayed to increment the time in steps of 50 time units (about 13 periods) until has decayed by at least 1/1000 at the transmission-flux plane. The slice in which time = vertical is interesting, because we can see the pulse propagating to the right, bouncing off of the holes, and also exciting a resonant mode in the cavity that sits in the center for a long time as it starts slowly leaking to the right. 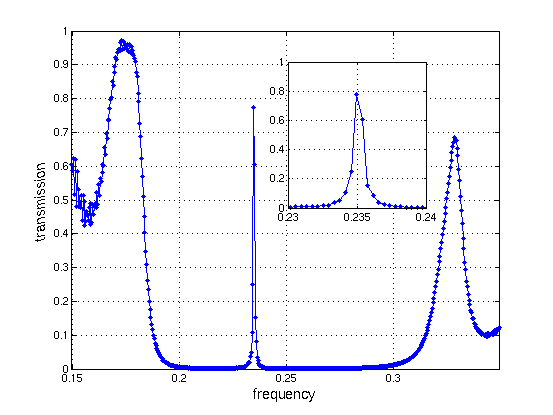 The band gap is clearly visible as the range of very low transmission, and in the middle of the band gap is a sharp peak corresponding to the resonant mode trapped in the defect. The inset enlarges this peak, and shows that we didn't use quite enough frequency points to capture the whole shape although we could fit to a Lorentzian if we wanted. At the edges of the band gaps, the transmission goes up in broad Fabry-Perot resonance peaks which we will examine in more detail below. There is also some high-frequency oscillation visible at the left of the plot, which is a numerical artifact due to our pulse not having enough amplitude in that range. The narrower the resonance peak (higher ), the harder this sort of direct transmission simulation is to perform — because of the Fourier uncertainty principle, we need to run for a time inversely related to the frequency resolution we would like to obtain. Fortunately, there is a much better way to study high- resonances, as described in the next section. See also Tutorial/Basics/Modes of a Ring Resonator. To study high- (long lifetime) resonant modes, it is much more efficient to excite them directly, placing a source inside the cavity, and analyze the resulting fields to obtain the frequencies and lifetimes of the modes. Here, we do precisely that for the above structure. See also Tutorial/Basics/Modes of a Ring Resonator and the Introduction. Here, you may notice a strange thing: we have specified (phase -1) for both mirror planes corresponding to odd symmetry. However, it may seem at first glance that an dipole at the origin has even symmetry! The subtlety here is that the magnetic field is a pseudovector, and is multiplied by under mirror flips, so it is odd when it looks even and vice versa. We aren't just being pedantic here — if you don't realize the difference between vectors, such as electric fields and currents, and pseudovectors, such as magnetic fields and currents, then you will have endless confusion because the electric and magnetic fields will seem to have different symmetry. See also Exploiting Symmetry. Just as in Tutorial/Basics/Modes of a Ring Resonator, we use the harminv command (which calls Harminv) to analyze the response at a point (here the field at the origin) for some time after the source has turned off. At the end, we also output the field for one period, to help us visualize the field below. See Chapter 10 of Photonic Crystals: Molding the Flow of Light (second edition) for more details. There are a variety of ways to separate out the two decay channels. For example, we can look at the power radiated in different directions. Here, we'll just increase the number N of holes and see what happens — as we increase N, should increase exponentially while remains roughly fixed, so that eventually saturates at . From the image, the field is clearly localized around the defect in the center as opposed to being spread out evenly in the crystal like a band-edge state would be. In the defect, the pattern is higher order than the previous mode. It has an extra pair of nodes in the direction. Finally, we consider a smaller, more abstract calculation that we really should have done first. In particular, we compute the band diagram of the infinite periodic waveguide by itself with no defects. The structure is shown below. This is very similar to the types of calculations that MPB performs, but with a different method that has its own strengths and weaknesses. By analyzing what solutions can propagate in the periodic structure, one gains fundamental insight into the aperiodic structures above. Let us briefly review the problem. In a periodic system of this sort, the eigen-solutions can be expressed in the form of Bloch modes: a periodic Bloch envelope multiplied by a planewave , where k is the Bloch wavevector. We wish to find the bands . In this case, there is only one direction of periodicity, so we only have one wavevector component . Moreover, the solutions are periodic functions of this wavevector: for a unit-period structure, and are redundant. Also, and are redundant by time-reversal symmetry, so we only need to look for solutions in the irreducible Brillouin zone from to . Solving for these eigenmodes is very similar to solving for the resonant modes of a cavity. We put in a pulse and analyze the response via Harminv except that our computational cell and boundary conditions are different. In particular, our computational cell is simply the unit cell of the periodicity, shown above. 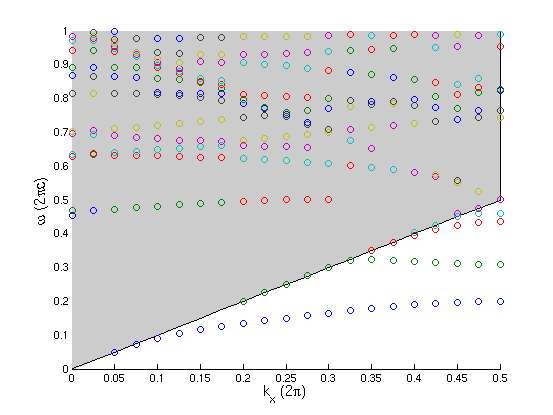 The ε function then obeys periodic boundary conditions, but the fields obey Bloch-periodic boundary conditions: the fields at the right side are times the fields at the left side. For each , we will do a separate computation to get the frequencies at that . Thus, we will define our computational cell as follows. 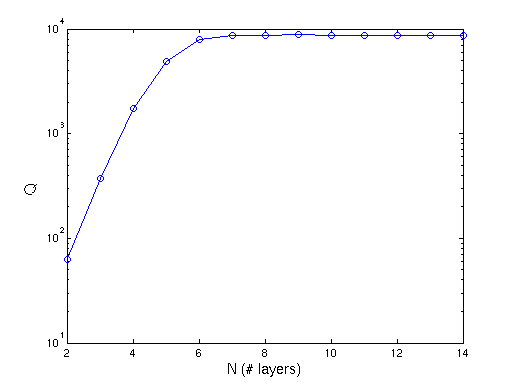 Since our structure is periodic, we don't want any absorbing layers in the direction: adding (direction Y) just specifies PML layers on the boundaries. The gray shaded region is the light cone, , which is the region corresponding to modes that are extended in the air surrounding the waveguide. Below the light cone, we see several discrete guided bands, which must have field patterns localized to the vicinity of the waveguide. The imaginary part of ω for bands below the light cone is very small, due to either numerical error or the finite computational cell size. Some tiny portion of the guided mode overlaps the PML. Note the band gap between the first and second guided mode, from about 0.2 to 0.3. Inside the light cone, we also see several discrete bands. These are leaky modes, or resonances, which have some intrinsic lifetime/loss because they couple with radiating states inside the light cone, which is reflected in the imaginary parts of their ω. Twice the imaginary part of ω is the energy loss rate per unit time; for a waveguide, it is more conventional to report loss per unit distance; to get this you would divide the loss per unit time by the group velocity = |slope|. Harminv only identifies leaky modes that have a substantial lifetime. The default threshold is a lifetime, or , of 50 periods. Computing band diagrams, especially for leaky modes, with a time-domain program like Meep involves several subtleties. For example, the accuracy of Harminv will go down if we specify too large a df (too narrow a source), because the increased number of modes makes the signal-processing more ill-conditioned. Sometimes, Harminv will report a spurious mode, which will appear as an isolated dot on the plot. Second, we sometimes have to be careful with modes and especially the imaginary parts to make sure they aren't an artifact of the cell being too small, or the signal-processing error being too large (either because the run is too short or because the bandwidth being searched is too large). Third, currently Meep doesn't attempt to "connect the dots" for the bands—the frequencies are printed in increasing order, but since modes disappear when their losses become too large this means that a single band may be split across several columns. On the plot, this is visible as single bands composed of differently colored dots. For example, there seem to be some bands that run right along the edge of the light cone. These are not leaky modes, but are artifacts of the fact that PML boundaries do not absorb well for light that is travelling parallel to the boundary, corresponding to extended modes at the boundary of the light cone. Below, we will see that these modes are not localized to the waveguide. From the top, the first two pictures show the first two guided bands underneath the light cone at . Note that the second guided band is propagating to the left, which is due to its negative slope (note, however, that there is a corresponding right-propagating mode at ). Note that they are strongly (exponentially) localized to the waveguide, as they should be. The next mode is the first leaky mode at . As goes to zero, in fact, this mode actually becomes lossless, a peculiarity of symmetry related to an effect demonstrated in Phys. Rev. B. 63, 125107, 2001. However, at this non-zero , the radiation loss is clearly visible. The next mode is one of the many higher-order leaky modes visible in the band diagram; we arbitrarily chose the backwards-propagating mode at , to plot. As can be seen from the field pattern, this mode has a very short wavelength in the material. This is short enough that it is worth checking how big the error introduced by the finite resolution is. By doubling the resolution to 40 pixels/unit, we found that this mode has shifted to , or about a 2% error at the lower resolution. Finally, we show one of the modes right along the edge of the light cone, at , . This mode is clearly not localized to the waveguide, and is just propagating through the air parallel to the waveguide — i.e. it is really part of the continuum of extended modes and its discreteness is an artifact of the finite cell and imperfect boundary conditions. For light propagating completely parallel to the boundary, PML is not very effective, so the imaginary part of ω is only -0.0008 for this field.